Enjoy on-demand services while you can. Whether it’s getting a lift whenever you want or ordering pad thai from the comfort of your couch, the rise of the on-demand economy has made a lot of people’s lives more convenient. But many of the services we know and love might not be around in a few years. Those that survive will continue to make aspects of your life as easy as touching a button—but there will be many more that will die a swift, quiet death. After the rapid growth of Uber and Lyft, venture capitalists and entrepreneurs saw major opportunities to apply the principles these ride-sharing apps embody in other verticals. Food and grocery delivery on-demand services such as Instacart and Doordash quickly followed, along with dozens of others such as parking service Luxe and dry-cleaning delivery Rinse. But just because massive companies like Airbnb are finding success in the travel sector doesn’t mean that on-demand delivery of goods and services in other areas has been solved. Other than ride sharing, lodging, and food delivery, mass-market adoption for on-demand uses is shaky at best. (In fact, we’re not even sure if the on-demand economy is technically legal.) 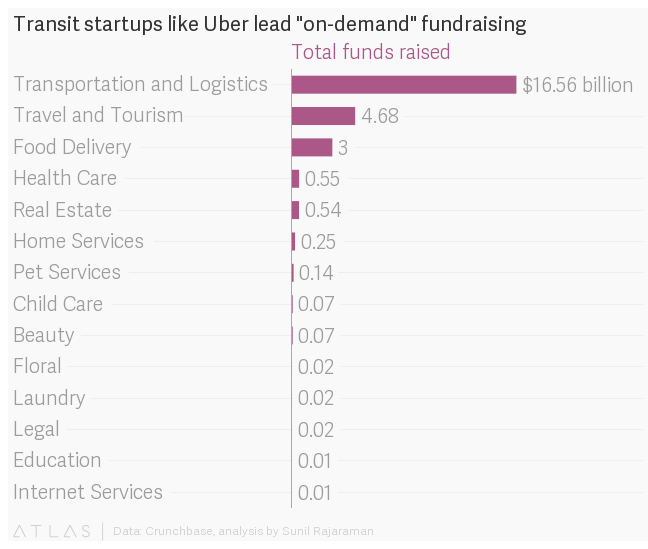 Instead, venture capital is fueling the space and essentially subsidizing services. But VC money does not make your company invincible, and you can only finance growth through venture money for so long—even Uber and Lyft are burning through a ton of cash. 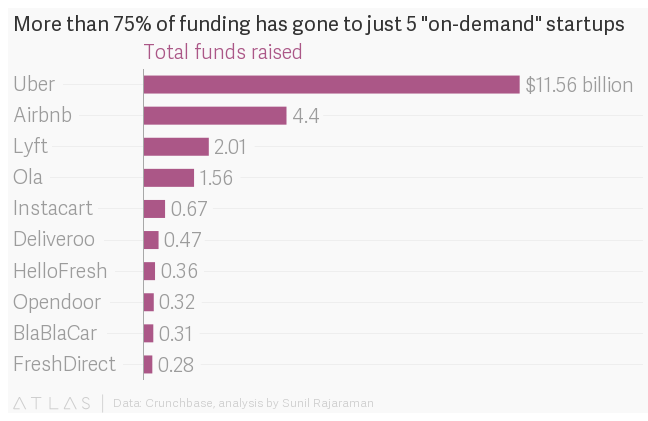 The on-demand bubble is poised to burst—and soon. This is because of our lack of brand loyalty, episodic customer use, and the use of precarious business models. The services that survive will focus on locking in customer and suppliers, objective outcomes (such as getting from point A to point B), a high frequency of use (you need food every day, for example), and services where automation can eventually help play a role to bring down costs. Consumers of on-demand products feel no inherent loyalty to a specific brand, especially when the outcome of the service is objective (such as ordering food from the same restaurant) and similarly priced. For example, if you want groceries delivered to your house, do you really care if you receive the goods from Amazon Prime, Google Shopping Express, or Instacart? How many times have you flipped back and forth between Uber and Lyft to find cheaper rates? If you have a single bad experience with one service, you’ll likely switch to another—there’s no shortage of them for you to try out, after all, and there are always new ones cropping up with cheap sign-up offers. If you want groceries delivered to your house, do you really care if you use Amazon Prime, Google Shopping Express, or Instacart? The same goes for the employees at these companies—if you can really call them that. (Uber doesn’t.) The on-demand economy is built on 1099 employees, who are independent contractors. These workers are not allotted the same level of benefits of full-time employees and are considered self-employed. This is both a strength of the model and a weakness. Every on-demand company that supplies services using people faces this problem. Companies like app-based restaurant Sprig have tried to solve this by making its delivery and logistics teams employees, thereby incentivizing them to stick to the service. Sprig employees of all levels are also entitled to perks, like stock options. Even services that have amazing reputations sometimes conclude that customer behavior is too episodic and inconsistent to predictably figure out realistic revenue goals to be profitable. For example, you may love Luxe’s service, but how often are you willing to actually use an on-demand valet? Many people are happy a service exists to serve a niche purpose, but they won’t use it on a regular enough basis to bring in a reliable cash flow and keep it afloat. If many of these on-demand companies are struggling to make a profit, why are VCs pouring money into these companies? It’s not because of charity. Many VCs believe it’s a “winner takes all” situation—that one brand will reign supreme, reach economies of scale, and reap most of the profit and the reward that comes with being left as the lone competitor standing—and they want their money on the winning horse. They’ll therefore back many smaller competitors with the hope of them rising to the top of the field and the rest falling away. That being said, Uber clearly has the lead in the ride-sharing market, but is still losing billions of dollars. So why continue investing? This is a long game, and many investors have the patience—and deep pockets—to continue to support these companies until they achieve “winner” status. The companies that persevere may survive just long enough for automated options to hit the market. For example, Uber already has driverless vehicles on the road (but is running into some major legal issues). As soon as the price for human service no longer plays a role, costs for a lot of on-demand companies could plummet, thus making the model viable for a lot of different verticals. Even five years ago, self-driving cars and Amazon drones felt like science fiction. But these types of innovations may be what’s necessary for the on-demand economy to be profitable outside of VC. ”Automation could have a very interesting role to play both in terms of cutting costs and providing services where people are either not available or cost effective,” says Laurie Yoler, founding board member of Tesla, board member of Zoox, and advisor to trucking telematics company Platform Science. For many of these on-demand services, consolidation may also be key. Competition is fierce, so in order to survive, businesses would be smart to share basic services to avoid competing for the same suppliers and customers. For example, pet-sitting companies DogVacay and Rover recently merged. We will also see companies that are delivering a good or service decide to use the same delivery platform: If you are going to deliver food, why would you build your own logistics network? For example, companies like Uber have have already built out platform strategies where they open up their logistics networks to other on-demand companies for a fee. We are already seeing a lot of on-demand companies die, and many of the successes are bleeding money to stay afloat and are in dire need of another VC cash injection to keep them running. So what will distinguish the winners from the losers? Loyalty and lock in: Great on-demand companies will focus on helping suppliers and consumers find a reason to stick with one service in the long-run. Subjectivity vs. objectivity of outcome: If you are focused on providing a service that has an objective outcome, you are in pretty good shape. Frequency of use: Winners will avoid the trap of episodic customer behavior by focusing on areas where the product actually needs to be used frequently. Automation and consolidation: We are already seeing signs of this with companies like Doordash, which is now making deliveries with robots. We are about to go through a tumultuous period where numerous services will run out of VC money. It will be interesting to see over the coming months who will survive, who will need to go back to the well for more cash, and who will disappear entirely.